Authentic Pasta Carbonara is easy to make, full of bacon flavor, and smothered in a cheesy egg sauce that will make you crave more. What is the origin of pasta carbonara? 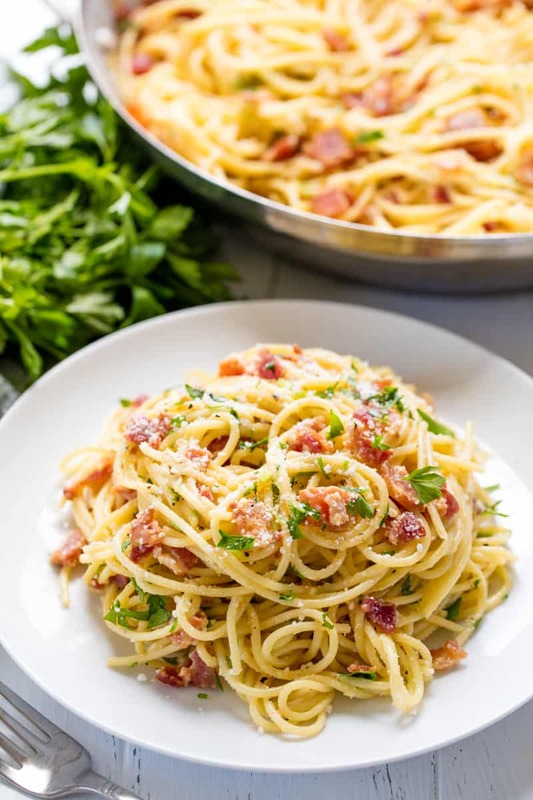 Pasta carbonara originates in the Rome region of Italy. No one knows the exact story behind the origination of the dish, but we do know where the location where the dish comes from. The word carbonara in Italian has to do with charcoal so many theories of the origin involve coal miners making the dish. However it came to be, the popularity of the dish increased throughout Italy and spread throughout the world after World War II. It is best to reheat pasta carbonara over the stove, and not in the microwave. Toss pasta in a skillet over medium-high heat for about 5 minutes until heated through. If the pasta appears dry, add olive oil 1 teaspoon at a time until the pasta no longer looks dry. 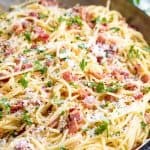 What kind of pasta should I use to make carbonara? Any kind of pasta can be used to make pasta carbonara, as carbonara refers to the sauce itself. Many times you will see a spaghetti type pasta used to make this dish, but other pasta shapes can be used as well. Check out my recipe for Eggless Spaghetti Carbonara for those who are allergic to eggs or simply don’t want to use them. Bring a large pot of water to a boil and season with salt. Cook pasta according to package directions. Reserve 1 1/2 cups of the pasta water before draining. In a large saucepan, cook bacon (or pancetta) over medium heat until crisp, about 7 to 10 minutes. Drain fat from bacon, reserving just 2 tablespoons of the grease. In a mixing bowl, whisk together egg yolks, eggs, and 1 cup pecorino romano cheese. Toss drained pasta with cooked bacon, and 2 tablespoons of bacon grease. Pour egg mixture in, along with reserved pasta water and toss together with pasta 2 minutes. Serve hot topped with remaining cheese, freshly ground pepper, and parsley to garnish. Are the eggs cooked? I didn’t think eating raw eggs are good for you. Yes, the heat from the pasta is enough to cook the eggs. They are not raw. This recipe was so delicious!! I have been following the same pasta carbonara recipe for years but decided to try this one and it was absolutely fantastic and this is the one I’m going to be following from now on!!! Absolutely the BEST I have ever made! Everyone loves it and so easy to do. Thanks! I have been following the Stay At Home Chef for several months now, and I have replicated several of he recipes. 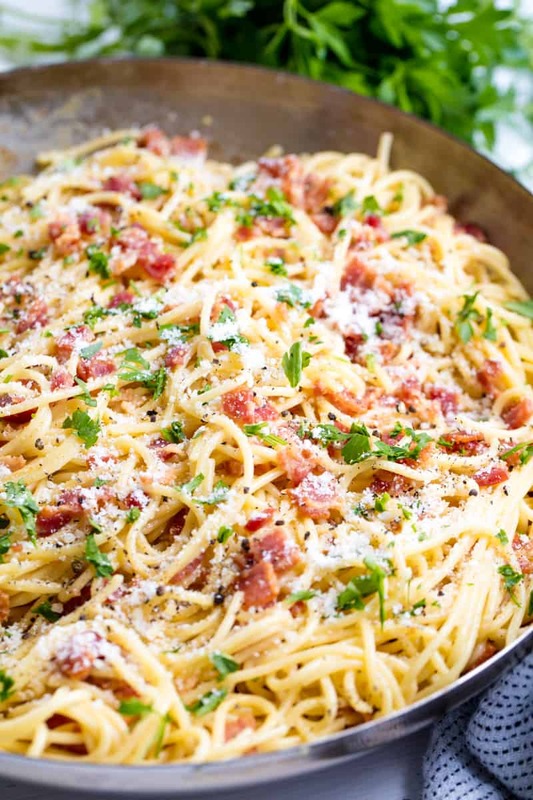 All have resulted in excellent results and gotten high praise from my wife, my son, and my ultra-picky 9-year-old grandson (“This is really good, Grandpa!”) This carbonara recipe is to die for, and caused me to respond to this blog. It is wonderful in flavor, texture and richness; and really simple to prepare with minimal cooking skills. Don’t wait another day to make this great dish for the ones you love. You’ll be a hero! Made the pasta carbonada…turned out great! Thanks for posing. Absolutely delicious!!! First time I have had this dish and it will now be a “go to” favorite. First time making a recipe is always a challenge for me but this was easy. Success!! Enjoy!! !